From the outside, this pair of robotic legs by a team of United States-based researchers may look like part of an experiment to see how lifelike scientists can make robots seem. But a key component within the machine could allow it to help people with serious spinal injuries learn how to walk again. The robotic legs are designed to mimic human neural architecture, musculoskeletal architecture, and sensory feedback pathways, in order to make the robot move exactly the way humans do. The robot uses an artificial form of a central pattern generator (CPG). In humanoids, a CPG is a neural network in the spine that helps the individual walk in rhythm. Thanks to an array of sensors, this robot can walk with the same effortlessness that fully ambulatory people possess. For instance, load sensors detect pressure when the robot's foot touches a surface. Though the robot currently can replicate only a walking gait, it is already helping scientists understand how humans learn to walk. 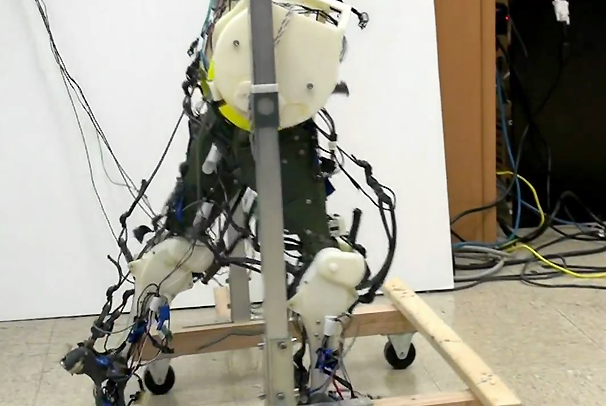 According to researchers from the University of Arizona, studying the robot's movements enabled them to conclude that even before babies learn to walk, their bodies already possess a simple CPG, which eventually matures to permit more-complex movements.